Dalziel Rugby Club’s penultimate league game of the 2016-2017 season ended in a 24-20 home defeat by RHC last Saturday. The Motherwell team are sitting in ninth place in BT National League Division 3 with 40 points from 21 matches after the loss at Dalziel Park. 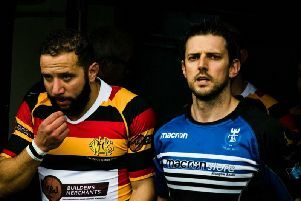 RHC, who are sitting seventh in the table, triumphed on the day despite Dalziel scoring points courtesy of two Gary Thornton tries, both of which were converted by Andrew Glover. Glover also kicked two penalties in the match. Dalziel team: Darren Hay, Alan Bowles, Nikky Devine, Michael Burnett, Kris Watters, Douglas Clark, Iain Davidson, Gary Thornton, Nathan Emery, Ryan Burrell, Darren Moon, Andrew Glover, Andy Scott, Lee McWhinnie. Subs: Alex Mowat, Les Barclay, Eddy Ferguson, Andy McLaren. See the www.motherwelltimes.co.uk website for action photographs by snapper Alan Watson from the game against RHC. Dalziel don’t play their final league game of this campaign until a week on Saturday, April 15. The Motherwell outfit face a trip to Highland that day for a game which kicks off at 3pm.